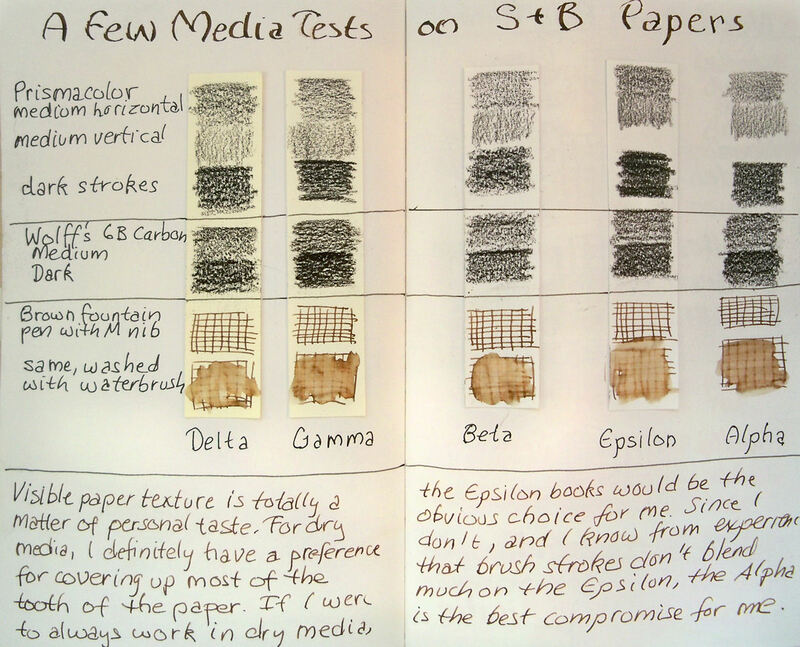 To help you see the differences in the various Stillman and Birn papers with dry media, I cut a strip of each type of their paper, made some swatches on them with Prismacolor Black colored pencil, Wolff's 6B Carbon Pencil, and brown ink (drawn with a fountain pen), and ink and wash, and glued them into my Alpha book. You can click the image below to get an up-close view. My assessment is that for dry media like colored pencil, the S&B Epsilon book yields the greatest value range and smoothness of application. It's a plate smooth paper, so the pencils make fuller contact with the paper. The Alpha and Gamma papers, which have a little more tooth to them, don't cover quite as fully, but still perform well. The Beta and Delta books show the most white in the swatches, since it's even more difficult than the Alpha to get into the tooth of the paper. Those uncovered areas (which I refer to as pinholes) reflect light, which translates as not being as dark a swatch. I did a colored pencil sketch on the Epsilon paper a few months ago, and was very impressed by that paper. The Prismacolor pencils loved the Epsilon surface, and my fountain pen glided across the paper like an ice skater. The Alpha actually does well with dry media, just not quite as well as the Epsilon, in my opinion. You can see in the pen swatches above that all of the papers took a Medium nib fountain pen just fine, and did a fine job with the wash too, though there is a difference in the feel when using fountain pens with less tooth vs. more tooth. I've been using fountain pens a lot on the Alpha paper and it's great for both pen and wash and pen alone. I have never encountered bleed-through with any of my fountain pen inks. 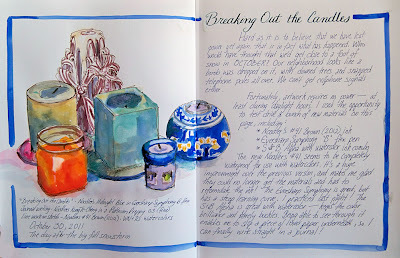 Below is a watercolor and ink sketch that I did across a two page spread of an 8.5x11" Stillman & Birn Alpha Hardbound book. I have been very pleased with the brilliance of the watercolor on the Alpha paper. The paper is sized internally and externally, so the paint sits nicely on the surface. The vellum surface, as you can see here, does not present a problem for pens. There is some very minimal buckling of the paper with the watercolor. It would bother me in a painting that I'm going to mat and frame, but in a sketchbook I kind of like it. It gives the paper character! I turned the page of the sketch above and photographed the top of the reverse side of the page that has most of the writing on it. 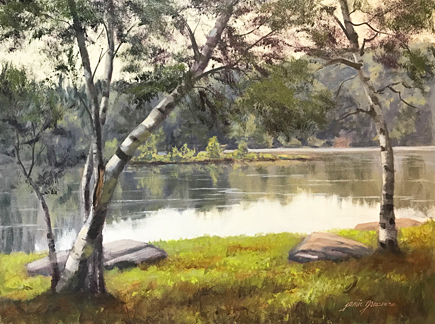 If you look at the image below, you'll see that there is a very slight ghosting of the watercolor border, page title and text. Initially, I thought this would really bother me. But in practice, it does not. Once I work on the reverse side, I only notice it if I'm looking for it. However, it does show in photos. 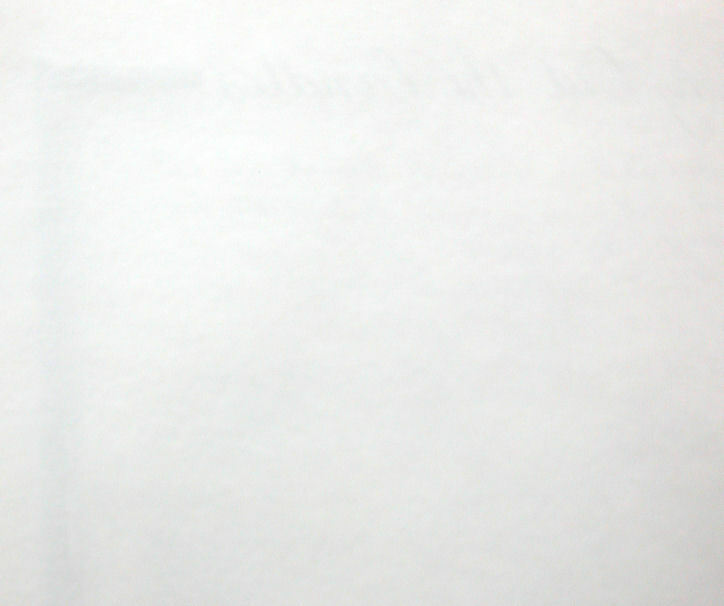 When you photograph or scan your work, you might encounter something like this (below) which is visible along with your image on that page. There may be times when this is an important factor, and other times when it doesn't matter. My suggestion is to skip a page when you encounter a situation where it matters. This can either be done by sketching only on the right hand sides, (skipping each left side), or sketching across every other two page spread, leaving the back sides blank. 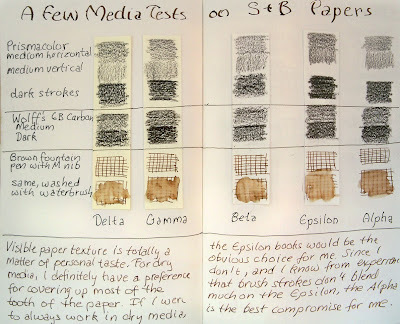 All of the ink samples in this post were written back to back on the paper, and you can see that even with these ink tests, the opacity of the paper was not a problem! All in all, the S&B Alpha Hardbound book impressed me. 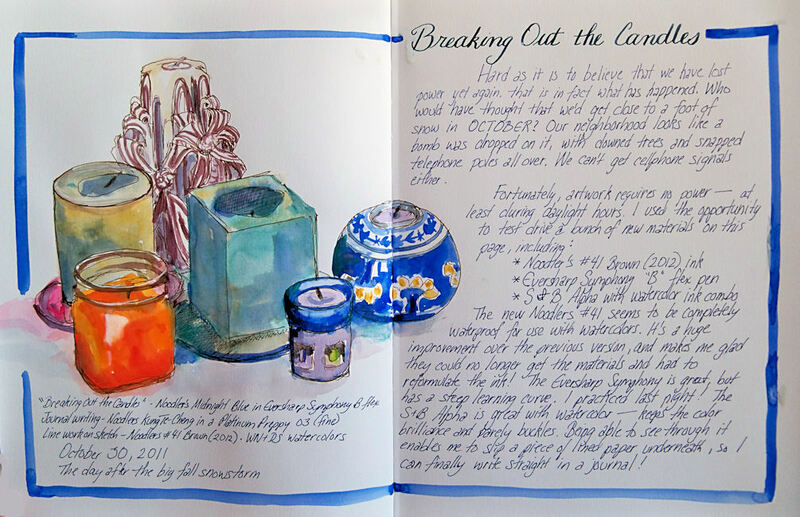 I threw a lot of different media at this book, turned pages into envelopes, removed the center spreads of the signatures, used multiple layers of acrylics, pastel ground, pastels, Cretacolor leads, inks, watercolor, gouache and pencil. The binding held together nice and tight, and I didn't find one situation where I couldn't "follow the paint" and do what I wanted to do. I would highly recommend this as a multi media book. Even though officially the book is good for "dry media and light washes," I was able to do much more with it without difficulty. Good review, Jamie! I like the way this book takes ink and washes too. I've been using the square one and love it! Thanks, Jamie, for this comprehensive review. I am so enjoying my much smaller Alpha and have not had much buckling with watercolour but tend to do a drier wash than many.